Transport materials from workstation with ease. Platform is raised and lowered with an electric linear actuator for precise positioning. Linear actuator will not allow platform to drift down - a common problem with hydraulic carts. 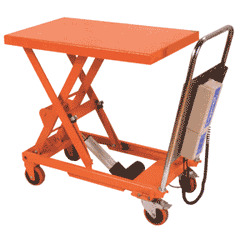 This linear actuated cart is powered with a 12 volt DC Battery and features an on-board charger. Hand held pendant control connects to power unit with a 6 foot coil cord. Emergency stop button standard on hand control. Includes two rigid and two swivel casters.